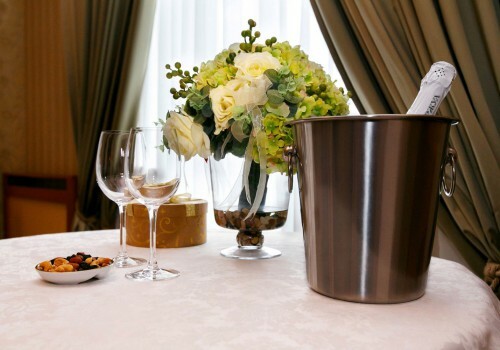 The Honored Guest Club is a loyalty program for regular guests, exclusive privileges and statuses. The program has 3 membership levels: Bronze, Silver and Gold, which correspond to the same club card. ☛ Club cards are numbered discount cards with privileges corresponding to the status level with no expiry date. A personal identification card number is tied to your name and e-mail address certifying the right of the cardholder to receive discounts. – 15% off discount on the “25:45” restaurant menu. Each guest with Welcome status who accumulates 15 nights1 at Peking Hotel during the calendar year will receive a Bronze card. Term of receiving the card — 15 nights spent at the hotel per member at available rates during the calendar year. 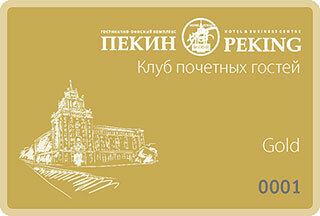 Each Bronze cardholder who accumulates 30 nights2 at Peking Hotel during the calendar year will receive a Silver card. Term of receiving the card — 30 nights spent at the hotel per member at available rates during the calendar year. Privileged check-out – until 02:00 p.m.
Each Silver cardholder who accumulates 45 nights2 at Peking Hotel during the calendar year will receive a Golden card. To receive a card — 45 nights spent at the hotel per member at available rates during the calendar year. Privileged check-out – until 2:00 p.m.
Privileged check-in – starting from 7:002 a.m.
1 If you book at available rates: on-line on the website www.hotelpeking.ru or make a reservation over the phone +7 (495) 980 59 95 or 8 800 250 05 50 from 09:00 am to 9:00 pm, toll-free call in Russia.